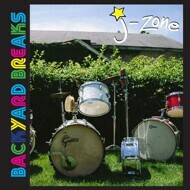 Producer/ drummer/ writer/ DJ/ MC J-Zone returns to the fold with Backyard Breaks, a follow-up to his debut drum break LP, 2014’s Lunch Breaks. This 18-cut offering continues where its predecessor left off, but offers more variety in a smaller package. Where Lunch Breaks channeled the drum mojo of the late 1960s exclusively, Backyard Breaks explores a wider sonic timeline of drumming and recording. The more focused sounds of the mid and late 1970s are also explored here, as well as some of the less orthodox rhythms and fills from those eras, giving the sampling producer a mixture of sounds to work with. Percussionist Ray May adds congas to a handful of tracks to mix things up and capture the b-boy spirit, while more options in the way of mikes, drum kits, snares and cymbals – in addition to more head room with the recording levels for more producer control - make Backyard Breaks a well-rounded follow-up to its predecessor. Between the recording of Lunch Breaks and Backyard Breaks, J-Zone has done studio drumming and sample replays for Danger Mouse, Marco Polo, RA the Rugged Man, Czarface (7L & Esoteric and Inspektah Deck), Apathy and many others, as well as providing drum tracks for film scores like CNN’s Fresh Dressed and the Stretch and Bobbito Documentary. Meeting the demands of producers and musicians, constructive feedback from Lunch Breaks and continuous research and practice have all aided J-Zone in presenting a more useful and versatile break record for producers looking for a classic break beat sound.